The SMTP server of your ISP or your hosting company may limit the quantity of email messages you can send per hour or per day depending on the server load and other factors. For example, if the SMTP server you’re sending emails through does allow sending only 100 emails per hour and your contact list contains 500 subscribers, the program will send the message to the first 100 contacts and stop. You’ll need to resume the process in some time to send another 100 emails and so on. In other words, you’ll need to watch over the sending process and resume delivery 5 times. If this is what you’re doing, forget about it from now and on. 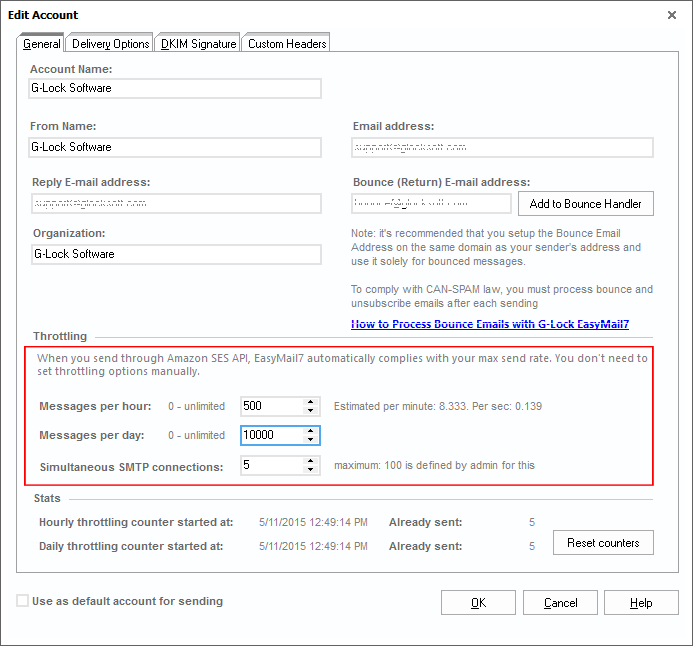 Do you know that you can automate the process with the throttling settings in EasyMail7? Enter the sending restrictions per hour and/or per day in the Throttling section. You can also enter the number of simultaneous SMTP connections if your SMTP server limits the number of messages you can send at the same time. Now EasyMail7 will automatically control your sending speed to respect your SMTP server restrictions. So, if you experience any email delivery issues caused by the SMTP server restrictions, download EasyMail7 now if you don’t have it yet and try yourself how this cool feature works.